Water leaks and pipe bursts can create costly and serious health problems if you do not get immediate help. If enough time has passed, mold infestation can take over and harm the environment. Most of the time, water damage only needs 24 hours to breed the secondary problems like mold and fungi, which is why time is of the essence when it comes to fixing your water damage. Let the professional flood cleanup crew of 911 Restoration of Downriver handle all of your water damage, mold removal, or fire restoration needs. Our IICRC certified technicians have the experience, knowledge, and empathy to provide you with the Fresh Start that you deserve. Our specialists are available 24/7/365 to make sure you get back to normal as quick as possible after suffering from water damage in Monroe and surrounding areas of Downriver. Don’t wait! Call promptly and we’ll make sure to exceed your expectations starting with arriving within 45 minutes of your call. The water damage that affects your property may be overwhelming. That’s why our team works hard to make the process as smooth and pain-free as possible. We accomplish this by making sure every technician is licensed, bonded, and insured which gives our customers peace of mind knowing that their water damage restoration is in good hands from start to finish. Our crew uses only the latest techniques and equipment to handle your water damage to help minimize damages and costs to you. We don’t believe in cutting corners, which is why only the best will do. Plus, we will walk you through the entire water damage restoration process so you are informed at every step. Our experience allows us to quickly identify sources of water damage like frozen pipes. In addition, we know that unattended water damage breeds mold quickly. That’s why we make sure to repair and fix any sources of flooding or leaking. Doing so ensures that mold doesn’t have a chance to breed, and you will get back to a Fresh Start quicker. As soon as you are aware of water damage, give the flood cleanup technicians at 911 Restoration Downriver a call. 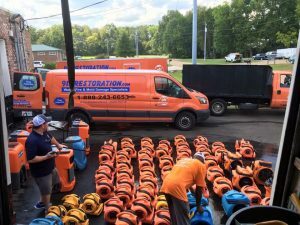 We’ll be there within 45 minutes to begin your water damage restoration in Monroe immediately. Cold weather and snow storms are a perfect environment for frozen pipes. Frozen pipes bring a host of problems that include annoyances like water not flowing to outright disaster in the form of burst pipes. When the pipes burst, the water escapes and creates a flooded basement (or any other room that pipes are in). Flooding brings a lot of damage to the property immediately. Standing water seeps into the cracks where the wall and floor meet, damages furniture, and also creates secondary damage like mold. That’s why calling the team at 911 Restoration needs to be an immediate priority during the winter. Burst pipes can happen any time day or night. Therefore, we are ready to respond any time day or night. The faster you get the professionals out to cleanup your basement flooding, the quicker your property can be restored to better than new. If you’re suffering from frozen pipes or other winter problems, call the team at 911 Restoration Downriver immediately. We’ll be there to start with a free visual inspection and then immediately get to work on your property. One of the most troublesome sources of property damage is mold infestation. Mold is usually hard to detect until it’s already a large problem. Mold will eat away at all of the organic materials that make up your property and belongings. In addition, it can also give occupants health problems such as headaches, breathing issues, and more even if the mold is not a toxic mold. Luckily for you, the mold remediation experts at 911 Restoration of Downriver are fully trained to handle all aspects of your mold removal process. Plus, if you feel like your health is at risk, we provide mold inspection and testing services so you can relax knowing the full extent of your mold problem is getting handled by professionals. Mold grows quickly, which is why our team moves even quicker so that we can get and stay ahead of the mold. The second you suspect mold is the second you should call the crew at 911 Restoration for professional mold remediation services. Our mold removal experts in Monroe are ready and waiting to begin your mold removal promptly. We guarantee to be there within 45 minutes of your call to get your property back to a Fresh Start. Especially in winter, there is always a risk of a sewage backup. The frozen pipes mentioned previously can also cause a sewage to cover your property due to bursting. When this happens, water and sewage explode out and spreads unless contained, repaired, and remediated. Sewage can be extremely harmful to a person’s health due to being a class 3 material. This is why you should call 911 Restoration for immediate emergency sewage cleanup. Besides frozen pipes, sewage backup also happens with pressure buildup in the sewer system overall. That’s why toilets can overflow. As soon as sewage backup occurs, be smart and call the sewage cleanup professionals at 911 Restoration to remedy the problem. Using hazmat gear, we safely commence with your sewage restoration cleanup. We use advanced water removal equipment as well as industrial grade detergents and cleaning solutions to ensure that your property is back to normal quickly and safely. Once the sewage is cleared, we remove odors and restore any water damage that occurred as well. So don’t wait. Call the sewage cleanup experts today so that a Fresh Start is in your grasp. Very few things are as devastating as fire damage. In addition to its damage ability, fire also presents an immediate risk to the safety of occupants. That’s why the first step is always to call the fire department to get the fire put out when the fire has grown to a certain point. The next step is calling our fire cleanup team at 911 Restoration of Downriver to begin your fire damage restoration. We will remove all water left over with our powerful water extraction equipment. In addition, we use the latest vacuums and blowers to remove the ash and soot the fire left behind. We will even remove the odor that smoke leaves so that literally every aspect of fire damage is made to seem like it never happened. If you’ve suffered a fire, or have water damage don’t wait to call the fire damage restoration crew in Downriver today. We’ll be there within 45 minutes to give you the Fresh Start you deserve. Disaster restoration implies that literally, any kind of damage can occur from water damage and mold to fire damage and ice dams. 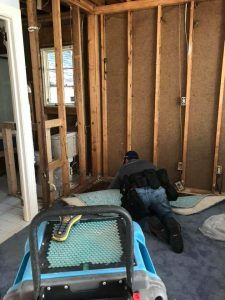 That’s why we make sure our technicians are trained beyond their certifications so you can relax knowing that no matter the property disaster emergency you may face, we have the situation in hand. Our top priority is to make sure the restoration is smooth and easy for you. To help us with that, we keep you informed through every step of the restoration process. In addition to being available to answer any questions you have, the Downriver team will also help you through the insurance process. We have worked with every insurance provider and know exactly what it will take to submit a successful claim. In fact, if you choose to, we can submit the claim for you. Once we are on the scene, we will take care of everything. You get to breathe easy knowing professionals are at work. We will take care of you at every step. If you have experienced a disaster, call us today. We’ll give you a Fresh Start you can trust in.